I took a very very rare Saturday off from the NARN (with a pre-recorded show) to attend the big gun rights rally last weekend. 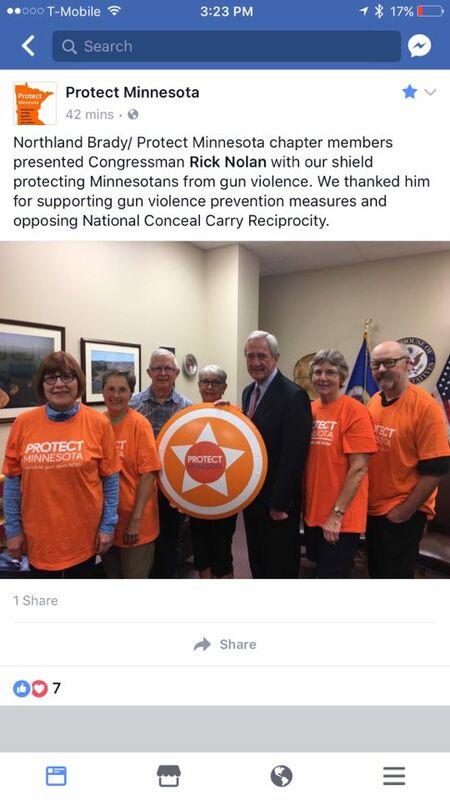 The rally – co-sponsored by the MN Gun Owners’ Caucus, the NRA and the RNC – drew around 3,000 people. The Strib, sure as can be, called it “hundreds”; it was just like 2004 all over again. There was a throng of great speakers – but I didn’t get to do much listening. I was a zone captain, leading a group of marshals that were watching out for ringers and troublemakers in the area in front of the stage. It was packed, of course – I logged 10,000 steps in the 2.5 hours I was going back and forth across the area. The only “trouble”…well, we’ll come back to that. The event was a huge success – and needs to be even bigger, if we’re going to show the legislature, the media, and Big Left who is boss. But the human rights crew were the big winners. Channels 4 and 5 spent more time interviewing the four criminal-safety advocates who held a “picnic” 100 hards away from the group than they spent interviewing actual attendees. Channel 9’s coverage focused on the one, single, solitary Confederate flag that showed up, as well as interviewing the least well-spoken people they could find. Their slant was nauseating, and their reporter – who was visibly upset by being around gun owners – was unforgiveable. Channel 9 may be an even bigger DFL PR firm than Channel 11. Minnesota Public Radio’s coverage was relatively fair on the surface – but word surfaced that they’re working on a story trying to tie gun rights groups to “racism”. And I’m sure you could find racists there – heck, they’re everywhere, including among the public radio audience. One (?) anti-gunner tweeted out a predictable “It looks like a lot of old white men”. Which was an intetersting non-observation observation; two of the speakers were black, two were women, one was a Hawaiian native. The crows was as white as, well, Minnesota at large (and as the critic) – but I saw black, Latino, native, Pacific islander, and many Asian attendees; the rally was vastly more racially diverse than any “Protect” MN or Moms Want Action meeting. Not to mention reps from the Pink Pistols – the gay self-defense group. And the most striking thing I noticed? Most gun rallies I’ve been to have in fact been overwhelmingly male – because shooters are overwhelmingly male. But this year, for the first time, I noticed women coming to the event. They streamed in in twos and threes and in small groups of women (along with countless others who came apparently with their significant others), and largely kept a low profile – fewer t-shits and flags, but lots of listening and participation and – the important part – signing up with the MNGOC and the NRA. 3,000 of the good guys has more political effect than 30,000 of their people – because the good guys come to play for keeps. Most lefty marchers are out to see and be seen and skip school and hit on babes and in quite a few cases earn a few bucks. The shooters? They’re in it for freedom. There’s no contest. Notwithstanding the Parkland students’ carefully coiffed media presence, younger people are pro-gun. We saw that at the rally, too – lots of young people, male and female. The next generation is promising. Of course, there’s a way to go. If you’re a shooter, you need to stand up and be heard – and never stop it. The orcs are doing whatever they can to sap your freedom; they need to be smacked down every session, every hearing, every bill, every day. Saturday was a good start.